Speaking of a "Beijing" around but is the name of Lao she. He was born in Beijing's children, he loves the brick a touch of autumn turn every tree and Bush a deep tan, in his text, see Beijing and Beijing of every hue of every hue. Today is his birthday 120th anniversary, let us with his words, he went into the eyes of the best place in the world. Lao she wrote fifteen novels, a total of twelve complete and two left unfinished novels, a total of two million and five hundred thousand words. 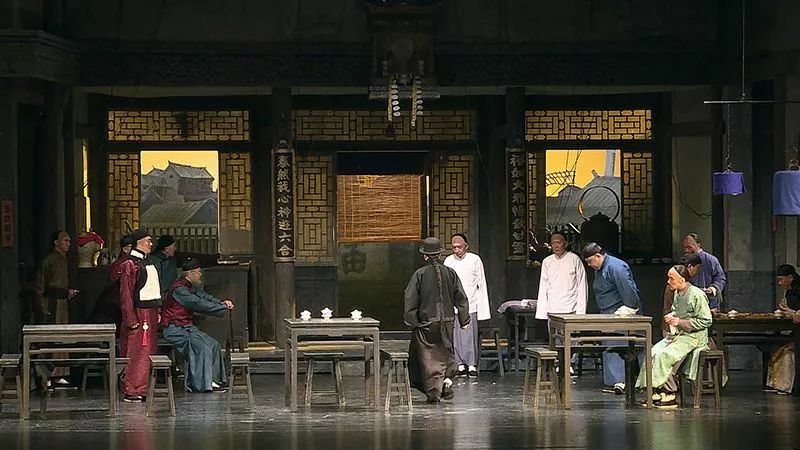 The five half is in Beijing as the geographical background, a total of one million and five hundred thousand words, accounting for all the words of the sixty percent novels of Lao she. Lao She's drama and is closely related to Beijing. After the liberation he wrote fourteen big drama, in addition to "Changan West" and "fist", is the place for Beijing. Even the "West Chang'an" and "fist" also has a scene in beijing. Lao She's debut was "Lao Zhang's philosophy", is twenty-six years old when he wrote the last important work is the novel "is under the red flag", written in 1963, when he was sixty-four years old. It can be said that he wrote a life of Beijing. Lao She's masterpiece, generally have the following several: the novel "camel Xiangzi" "Sishitongtang" "is under the red flag", "crescent moon", in the short story "my life", "long Xugou drama" teahouse ". This masterpiece, coincidentally, is all about Beijing. It can be said that the most exciting part is written in the works of Lao She in Beijing. In his works, the story can be made up, the character may be created, but the characters and story of the location of the activity environment is basically true. He could easily put the real Beijing city moved into his own fiction and drama. He wrote in the real names written by the number of permutations, in front of the row is: Beihai, lanes, Zhongshan Park, Deshengmen, Dongan market, Gokokuji, moat, Longxugou, Xisi arch, bridge, Jishuitan, Zhengyang gate...... Beihai is a place to write the most times, in different works mentioned before and after 50 times, his birthplace is in the two lanes. He is familiar with the city of Beijing, from the "Xiangzi" camel back to Beijing route can get a glimpse or two - Xiangzi camel escape Haidian Moshi pass, into several specific routes: Moshi pass - to the Northeast turned the Jinding mountain: Li Wang Fen - Badachu - Siping Taiwan - xingshikou - nanxinzhuang - Beixinzhuang, Wei Jia Cun - Nan He Tan - Red Hill - Jie Wangfu - - Haidian - New Providence park. Out of curiosity, his son Shu Yi had a walk along this route, found the route to Xiangzi Lao She's design is completely in line with the actual situation, can stand the check, really is like the story demanded, along the root to go, the azimuth of the terrain on the order of,,, the name of the village, this may hide some, lest Xiangzi be exposed. In Lao She's writing in forty-one years, most of the time are not in Beijing, only seventeen years after the liberation is actually spent in Beijing. But whether in London, in Ji'nan, in Qingdao, in Chongqing, in New York, he wrote in Beijing. He wanted to Beijing, his heart is always in Beijing. It can be said that Beijing is the source of his writing. Under his pen you see "Beijing Spring Festival"
When new year's day and new year's Eve different: New Year's Eve, the streets were filled with people; new year's day, the shop are on board, in front of a pile of cardboard last night fireworks, the city is in the rest of the men sent out before noon, to relatives and friends home to pay New Year's call. The women guests at home. At the same time, outside the city there are many temples open, let people visit, the hawkers stalls outside the temple, selling tea, food and all kinds of fun. North of the city outside Dazhongsi, Xicheng outside White Cloud Temple, Nancheng fire Temple (Changdian) is one of the most famous. However, the temple on the first two or three days, is not very busy, because people are still busy with each other a happy new year, and this time. The fifth six Temple began scenery, especially the children eager to visit, to see the scenery outside is, can ride a donkey, can buy those new year special toys. A car racing game outside the White Cloud Temple square; in the old, is said to have the camel race. The game is not for who who first 2, but a better attitude and skill performance in front of the audience and the rider's horse. Most of the operators in the opening, and set off firecrackers, from dawn to early in the morning, the artillery stopped. Although the opening of the piece, but in addition to selling food and other important commodity shop, we are not very busy, with the guys can also take turns to visit the temple, stroll flyover and cinemas. Under his pen in Beijing is the best place, the ideal family should be placed in Beijing. My ideal family have seven small cottage: one is the living room, antique calligraphy and painting all necessary, as long as a few loose comfortable chairs, table one or two. A study, many books, no matter what the front page and text, but is I love reading; a desk, desktop is China paint, put the hot cup of tea to burn a round white print; do not pay attention to stationery, but are very good; on the table there are one or two old flower, inserted in the vial...... The yard must be large, there are a few small plant fruit trees on the wall. In addition to a rectangular flat land, no grass, open enough to taijiquan. Other places are flowers -- not a precious trouble, but Chang Mao spend. There are at least a cat in the house, at least in the courtyard has two pots of goldfish; trees hanging on the second green dumplings, Guo Guo Ming casually...... The whole family, because eating simple and clean, and not always idle, so the body is not bad. Because the body is good, so there is no anger, everybody does not love the grouch. In addition to the real thing kitten goldfish spawning, who also don't worry, angry white face. We also look good, don't it look bored. Clothes do not pay attention to, are very strong and simple; never wear smelly and hard leather shoes. The man is decent, not dew movie star gas; women are not fit, lips curly hair, nose toward the day. The children didn't roll off his tongue to speak, naughty without hate. The family was better in Peiping, followed by Chengdu and Qingdao, and also bad in Suzhou. Anyway, anyway, must be in China, because Chinese is the top of civilization and safety of the country; the ideal family must be in the ideal state in the. He then suffer poverty, good and strong mother and mother how much the incarnation is the city of Beijing. The mother is poor, old, hard to old, is full of life as such. She will suffer the most. To help friends and neighbors, she ran in front: she will give the baby wash three - poor friends can therefore spend less a "grandmother" money - she will give the children scraping, her hair, she will give young people face...... What she can do, there are. But she never quarrel. She would suffer, not making gas...... From the school to the primary school, middle school, I have experienced at least twenty teachers, which gave me a great impact, also have no effect, but my real teacher, the character passed to me, is my mother. My mother was illiterate, she gave me the life education. All this so he had always wanted to Beijing "," the Miss Peiping morning glory, against the wall of bamboo and grass Jasmine "," miss the rain, leek leaves also often with specks of mud splashed when. The red and green vegetable stalls almost like the beauty of poetry. There are a lot of fruit by Western and Northern to the Xishan Shaguo, Begonia, Beishan dateplumpersimmon persimmon, entered the city with a layer of white frost son ah......"
Not like Beijing as it is complex and has a marginal, I can touch it with red jujube of the old city wall! Facing the water beach, is behind the wall, sitting on a rock to see tiny tadpoles in the water or tender dragonflies on ashiba, I can be happy to sit one day in complete comfort, no desire or fear, like a child sleeping in the cradle. Yes, Beijing has a lively place, but it is similar to Tai Chi, moving in a static. Paris has many places make people tired, so the coffee and wine is necessary, in order to stimulate; in Peiping, a gentle jasmine scented green tea tea will be.